A visual poem of incomparable beauty, this masterpiece from director Nacer Khemir (Wanderers of the Desert) begins with the story of a blind dervish named Bab’Aziz and his spirited granddaughter, Ishtar. Together they wander the desert in search of a great reunion of dervishes that takes place just once every thirty years. With faith as their only guide, the two journey for days through the expansive, barren landscape. 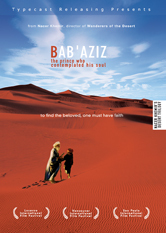 To keep Ishtar entertained, Bab’Aziz relays the ancient tale of a prince who relinquished his realm in order to remain next to a small pool in the desert, staring into its depths while contemplating his soul. As the tale of the prince unfolds, the two encounter other travelers with stories of their own - including Osman, who longs for the beautiful woman he met at the bottom of a well, and Zaid, who searches for the ravishing young woman who fled from him after being seduced by his songs. Filled with breathtaking images and wonderful music, Nacir Khemir has created a fairytale-like story of longing and belonging, filmed in the enchanting and ever-shifting sandscapes of Tunisia and Iran. Director Nacer Khemir's past cinematic achievements include his award-winning features Les Baliseurs du Désert (Wanderers of the Desert), awarded Grand Prix of the Festival des Trois Continents in 1984, and Le Collier Perdu de la Colombe (The Dove's Lost Necklace), which won the Special Jury Prize at Locarno in 1991. The script was written by Nacer Khemir with the participation of screenwriter Tonino Guerra (Amarcord, Night of the Shooting Stars, Blowup and L’Avventura).